Wow, color us surprised. The exterior did not wow us but we got in the car, and fell in love within our first day with the Sorento. It’s a kind of car that just keeps surpassing expectations from the moment you mash the throttle, throw it into a corner or open the sunroof. Every aspect of the car overdelivers except the sticker price. And one thing we love is the option list is empty and does not come with a $6000 price tage. 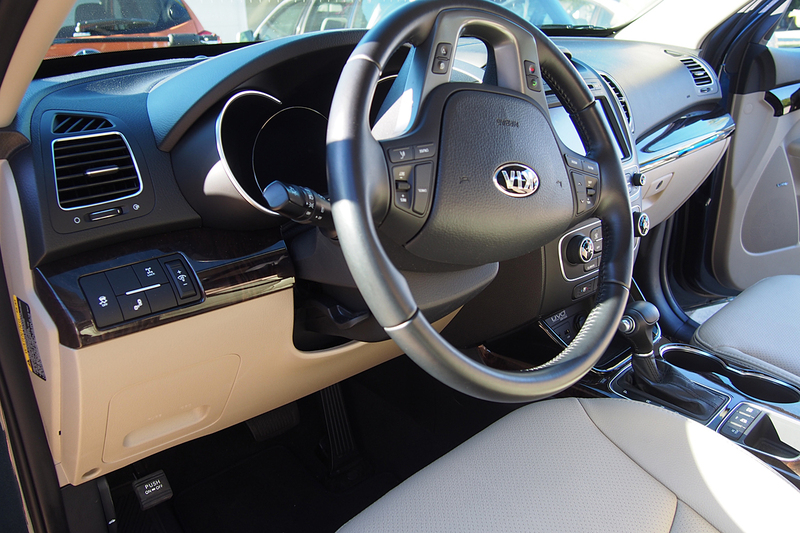 Most everything is included in our trim level package. 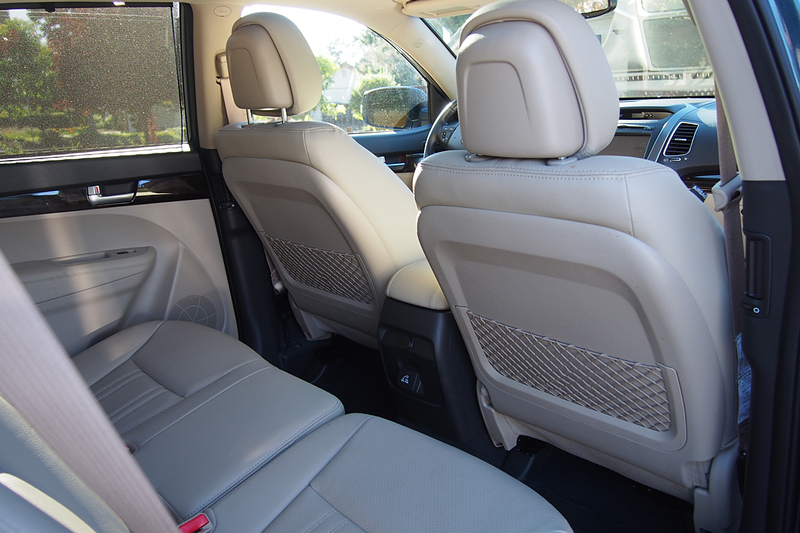 The Sorento gains standard leather seating in EX trim, while the LX V6 now comes standard with a third-row seat. From the outside, the Sorento lacks the visual pop of Kia’s other products, such as the stylish Soul and Optima. But this isn’t necessarily a bad thing, as it may widen the Sorento’s appeal to more mainstream buyers. 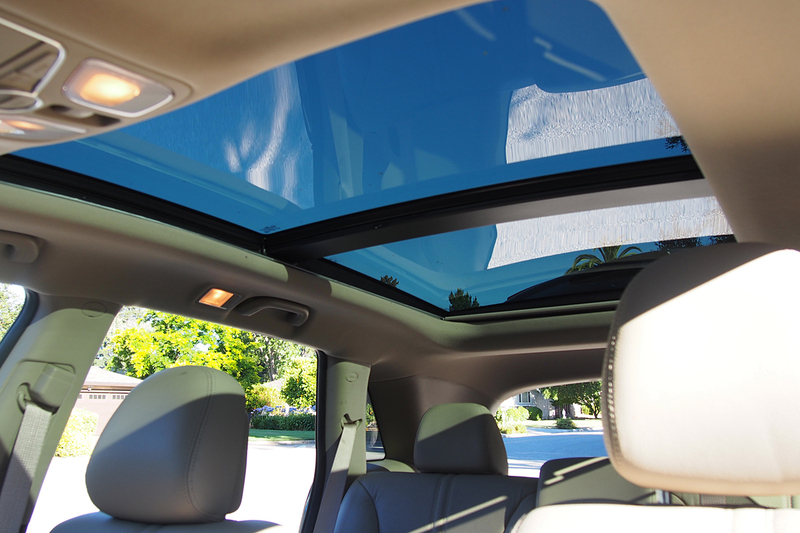 Step inside the Sorento and it’s a different story. The interior simply outshines the competition with an elegant design, rich materials and fabric choices–such as white-on-ebony leather–features usually reserved for more expensive luxury models. In addition to its ability to carry seven passengers, the Sorento’s fuel economy and horsepower are near the top of its class. And its pricing undercuts just about everything comparable. The Sorento also comes with a 5-year/60,000-mile vehicle warranty and 10-year/100,000-mile powertrain warranty that is virtually unmatched. And for those who feel strongly about buying American, it will come as welcome news that the Sorento is built at Kia’s plant in West Point, Georgia. Kia packs a lot of utility into the Sorento, giving it an available third-row seat and 60/40 split folding, second-row seats. Although the third-row seat expands passenger occupancy to seven, it’s really only suitable for young children. With the third-row seat in the up position, the Sorento’s generous 37 cu ft of cargo space dwindles to around 9.1 cu ft.
On the comfort side of the equation, the Sorento exceeds expectations. Base LX models are nicely equipped with such standard features as a tilt/telescoping steering wheel, cruise control, USB interface and Bluetooth hands-free phone connectivity. The EX trim adds dual-zone automatic climate control, an 8-way power driver’s seat, fog lamps and a backup camera. Move to the top-of-the line SX and you’ll get full leather seating, Kia’s navigation radio and a 10-speaker 550-watt Infinity audio system. Options for the Sorento include all-wheel drive, heated front seats, heated steering wheel, an air-cooled driver’s seat, power folding side mirrors and a panoramic glass moonroof. Powered by Microsoft, the UVO information and entertainment system allows voice control of Bluetooth-enabled cell phones as well as a portable music devices like an iPod or iPhone. 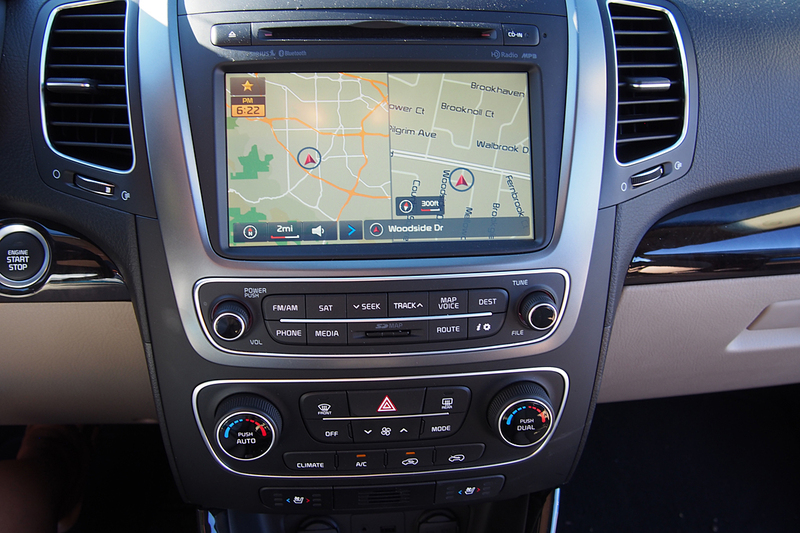 Add the available navigation system and you’ll enjoy SiriusXM Traffic free for three months (after that, you’ll need to pay for a subscription). SiriusXM Traffic uses the navigation system to alert you of approaching traffic problems. If there’s a delay, the navigation can be used to calculate a new route around the jam. The Sorento’s standard engine is a 2.4-liter 4-cylinder good for 175 horsepower and 169 lb-ft of torque. Available only on the LX, this engine may help the Sorento achieve a low starting price, but it won’t do much to help move it along when fully loaded. A better choice is the 2.4-liter GDI gasoline direct injection 4-cylinder (optional on the Sorento LX, standard on the EX), which bumps horsepower to 191 and torque to 181 lb-ft. GDI technology boosts horsepower while also offering better fuel efficiency. Fuel economy for the 2.4-liter is rated at 21-mpg city/29-mpg highway (front-wheel drive) and 21/27 mpg (all-wheel drive). The GDI changes those figures to 21/30 mpg and 20/26 mpg, respectively. The Sorento’s 3.5-liter V6 is available on the LX, EX and SX models. With 276 hp and 248 lb-ft of torque, this engine has the muscle to move a loaded Sorento with ease. Yet its fuel economy figures of 20-mpg city/26-mpg highway are not far below the 4-cylinder’s figures. The all-wheel drive (AWD) model attains slightly lower marks of 18/24 mpg. No matter which engine you choose, it will be connected to Kia’s electronically controlled Sportmatic 6-speed automatic transmission with manual shift control. Those who opt for the AWD option will get a full-time on-demand system with a lockable center differential that’s useful when driving slowly through heavy snow or light off-road duty. The 2013 Kia Sorento offers a full complement of standard safety equipment, including electronic traction and stability control, 4-wheel ABS, front seat side-impact airbags, first- and second-row side curtain airbags (the third-row seat is not protected) and Hill Start Assist to keep the vehicle from rolling backward when pulling away on a steep grade. The Kia Sorento is also an Insurance Institute for Highway Safety Top Safety Pick, getting top marks in the frontal offset, side impact and roof strength crash tests. 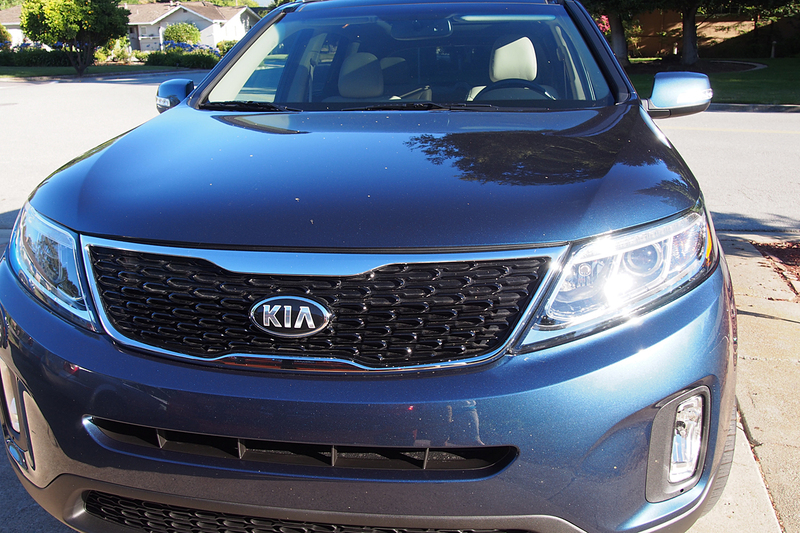 Despite its size, the Sorento rides and drives like a midsize sedan. With its wide track and independent front and rear suspension, the Sorento delivers a smooth, controlled ride. Excessive body lean was observed only during extreme hard cornering maneuvers. The Sorento’s unobtrusive stability control allows for somewhat sporty driving. But when the road gets rougher, we did notice more noise and impact harshness than in comparable SUVs. We also found that the Sorento’s steering wheel feels a bit heavy to turn, and its suspension favors the softer side of the spectrum. If you’re looking for an SUV with a firmer suspension and a sportier attitude, we suggest the Ford Edge or the Mazda CX-5 (though neither offers third-row seating). We’re not big fans of the standard 2.4-liter’s performance, but we do like the GDI version, which offers better off-the-line acceleration and passing power. The Sorento’s 3.5-liter V6 not only ups performance but also increases the maximum tow rating from 1,650 to 3,500 pounds. Dodge Journey: The Journey offers more room for its third-row occupants and can match the Sorento’s feature and content offerings. 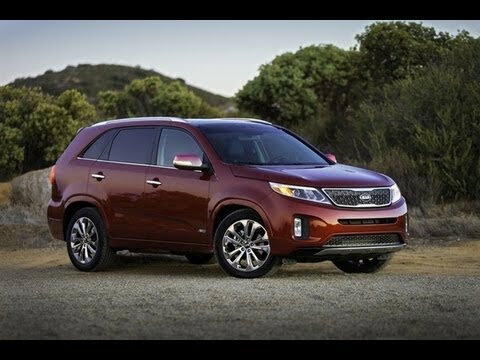 But the Sorento gets better fuel economy and has a more powerful 4-cylinder engine. Ford Edge: The Ford Edge has a more buttoned-down feel to it, with a sportier ride and an available turbocharged engine; however, the Edge doesn’t offer a third-row seat option, and its pricing starts well above the Sorento. Toyota Highlander: The Highlander holds its value better than the Sorento, but a comparably equipped model costs a bit more and doesn’t offer as good a warranty. Step up to the SX or Limited models from $35,850 and $38,850 respectively, and AWD can be added as an option to all trim levels for an extra $1,700. 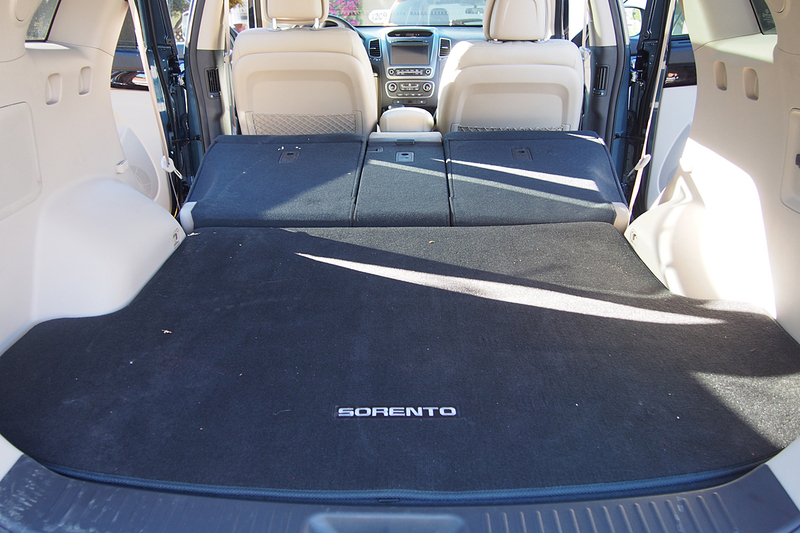 All in, the 2014 Sorento is a decent SUV. Though undeniably improved, it doesn’t look it, and that could be its biggest drawback. Continuing to be a strong value package with checkmarks in both the plus and minus columns, in a sea of attractive new offerings the Sorento fails to deliver any wows.